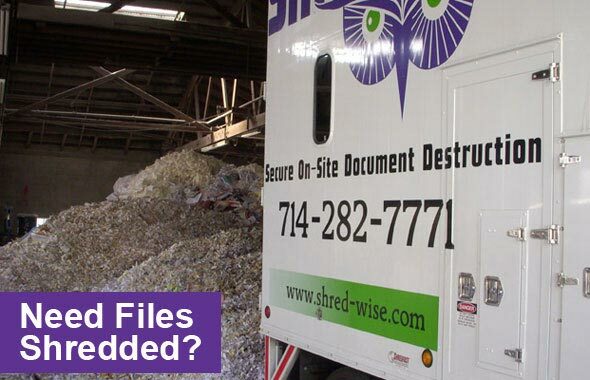 Whether you have a one-time or ongoing shredding need, make Shred Wise Inc. your first call for mobile document destruction services in Yorba Linda and Placentia, CA. We offer competitive rates, effective and secure document shredding, and unbeatable customer service. We have nearly a decade of experience and serve both commercial and residential clients. Our clients can expect us to always be professional, timely, and knowledgeable in all aspects of information destruction. We are extremely familiar with current local and federal privacy legislation; and have designed our shredding services to meet them. What sets Shred Wise apart from other shredding companies serving Yorba Linda and Placentia is our dedicated, flexible, and very responsive service. By working with us, you’ll never be locked into a long-term contract or one that it is hard to get out of. Our regularly scheduled shredding service agreements are, in essence, month to month. They also come with a number of added benefits that other shredding companies struggle to offer, such as providing last-minute mobile shredding visits in between regularly scheduled service without making such value-added service cost prohibitive. 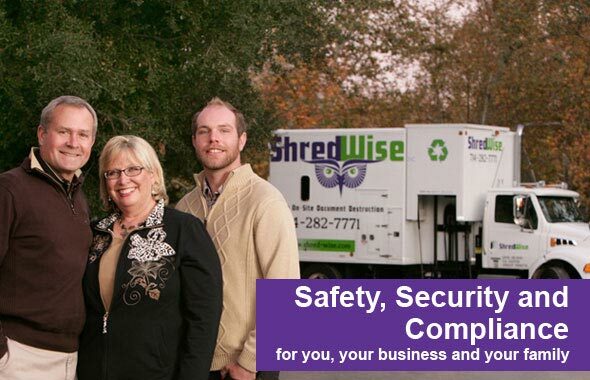 Shred Wise is proud to be a locally-based, family-owned and -operated mobile shredding company. As such, we are truly invested in making our clients happy and building long-term relationships. That’s why you’ll always enjoy service with a smile, straight-forward service agreements, and customizable shredding solutions. Choose from on-site or off-site document shredding in Yorba Linda and Placentia that is performed on an ongoing regularly scheduled basis or just when you have a large amount of sensitive documents to purge. Shred Wise is licensed and insured. We’re also NAID (National Association for Information Destruction) compliant. Call today to obtain a free estimate or schedule mobile shredding service. You are also welcome to stop by during our normal business hours to drop off your boxes of paper for shredding at our facility, located at 3222 E. Chapman Ave. in Orange, California, 92869. Drop-off shredding is available seven days a week, and our mobile shredding services are available Monday through Friday. More Reasons to Choose Shred Wise Inc.
Shred Wise is your partner in helping you protect the privacy of your patients. We’ve been working with hospitals, doctor offices, dentists, convalescent homes, recovery centers, outpatient clients, and more for nearly a decade, and understand how critical secure disposal is to meeting HIPAA’s strict requirements as well as other current privacy laws. Call today for the one-time or ongoing destruction of patient records and other identifiable medical information. We provide off-site shredding at our Orange facility and on-site/mobile paper shredding services in Yorba Linda and Placentia. Since HIPAA went into effect, the standards for protecting the privacy of pet owners and their pets has been expanding. While there are no federal laws regulating the protection of animal medical records, the AVMA’s Principles of Veterinary Medical Ethics generally recommends that veterinary practices should treat pet records as if they are confidential and protect them as such, retaining them for the requisite amount of time, only releasing them with proper authorization, and disposing of them properly. Additionally, like any other business, animal care facilities handle credit card information, employee applications, HR files, bank records, signed receipts, taxes, and other information that need to be kept secure until they are destroyed. For all these reasons and more, it’s a good idea to have a reliable and experienced paper shredding company in Orange County provide the document destruction services you need in Placentia and Yorba Linda. 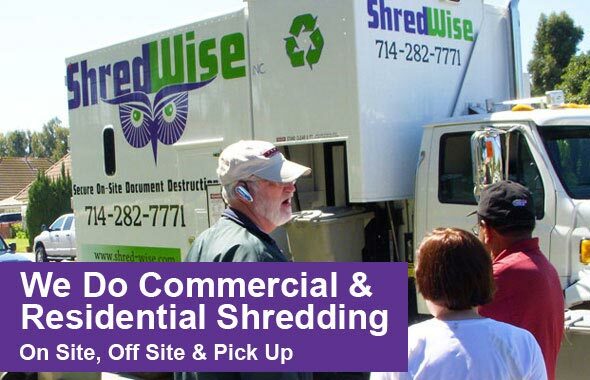 Shred Wise is qualified to meet government shredding needs in Placentia and Yorba Linda. Our on-site and off-site shredding services will not only comply with local, state, and federal privacy guidelines that pertain to government entities, but also be competitively priced and customizable. Call today and we will help you create a comprehensive records retention plan, determine where to place secure shred containers, and provide an estimate for our mobile shredding services in Placentia and Yorba Linda. At Shred Wise, we have the capacity, knowledge, and experience to support the document destruction needs of attorneys and law firms in Yorba Linda and Placentia, CA. We can supply you with secure bins and consoles to store your confidential information until they are ready to be shredded; and we can be trusted to safely transport and shred all of your paper. We routinely destroy wills, trusts, court cases, briefs, charts, depositions, discovery, trial transcripts, medical information, and more to protect attorney-client privilege and keep our customers in the legal industry compliant with local and federal privacy laws. Bookkeepers, accounting firms, and CPAs can trust Shred Wise to meet their specific paper shredding needs in Yorba Linda and Placentia. We offer off-site and on-site shredding services that comply with local, state, and federal privacy laws, and are affordable and customizable. There are no long-term or automatically renewing contracts for those interested in ongoing, regularly scheduled service, as well as no hidden or exorbitant fees for our above-and-beyond service. Call us today and we’ll help you create a plan for securely storing and shredding your financial statements, payroll journals, bookkeeping records, sales documents, purchase receipts, client information, taxes on file, audits, and more. Shred Wise is happy to serve the document destruction needs of residential clients in Placentia & Yorba Linda. Depending upon the amount of paper they need shredded, they can choose to bring their paper to our facility in Orange or they can schedule onsite/mobile shredding. Typically, it is most cost effective–as well as convenient–to have us come to you. On-site mobile shredding can be scheduled Monday through Friday. Whether you choose to bring your paper to us or have us go to you, you’ll be able to witness your documents getting shredded in a matter of minutes and be provided with a Certificate of Destruction to reassure you that your papers have been completely destroyed. Call today to learn more.